The President is no longer helping get Don’t Ask Don’t Tell repealed this year, even though he promised to do so in his State of the Union. So the gays are finally fighting back. GetEqual, the new LGBT advocacy group that organized last month’s civil disobedience where Lt Dan Choi and Capt Jim Pietrangelo handcuffed themselves to the White House gates to protest the President’s inaction on “Don’t Ask, Don’t Tell,” and where numerous protesters staged a sit-in in Speaker Pelosi’s DC and SF offices, organized a double whammy of civil disobedience targeting the President in the past 24 hours. Last night, GetEqual protesters repeatedly interrupted the President’s speech at a fundraiser for US Senate Barbara Boxer in Los Angeles. The President was visibly angry the second time the “repeal DADT” protesters interrupted the President. 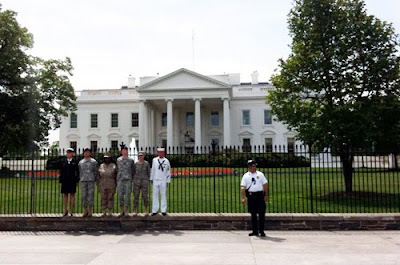 Today, GetEqual organized six former military vets to handcuff themselves to the White House gates. The vets included Choi and Pietrangelo. They were joined today by Petty Officer Larry Whitt, Petty Officer Autumn Sandeen (from Pam’s House Blend), Cadet Mara Boyd, and Cpl. Evelyn Thomas. GetEqual issued a statement saying that these actions are just the beginning, and that the White House should expect more civil disobedience until President Obama keeps his promises to the gay community about ENDA, DADT, DOMA and more. After the vets had been at the fence for around half hour or so, suddenly the police started to freak out. 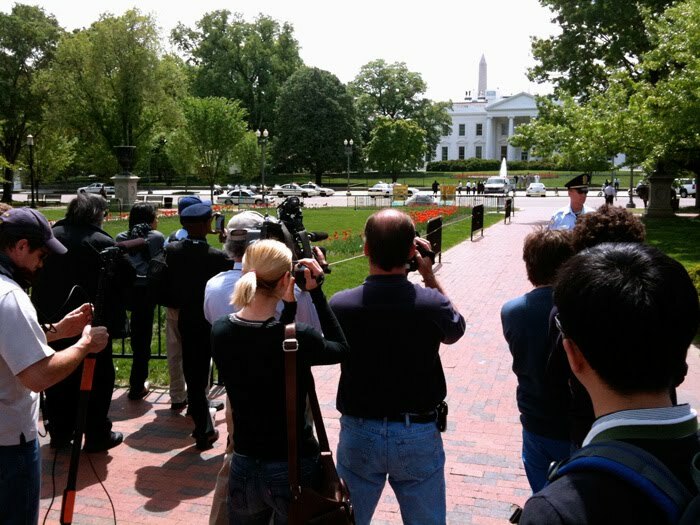 Out of nowhere, they closed Lafayette Park – something none of us, including the mainstream media assembled there – had ever seen. The police literally ordered the press to leave, and pushed all us back halfway to the end of the park, telling us the park was closed. They were telling the police that they were being intentionally stopped from covering the story. And they were. It was interesting that the White House so freaked out this time around, when there were only six people on the fence, and the crowd was mostly tourists. Last time, there were 200 raucous demonstrators watching and the police weren’t worried at all. It seems GetEqual got the White House’s attention. Quite possibly the most delicious part of the entire story was when I got a phone call that Robin McGehee had just sighted White House press secretary Robert Gibbs, apparently walking back to the White House from lunch. Robin proceeded to run after Gibbs! She caught up with Gibbs and had a little chat about the President and DADT. Robin will be sharing more about that little moment shortly.